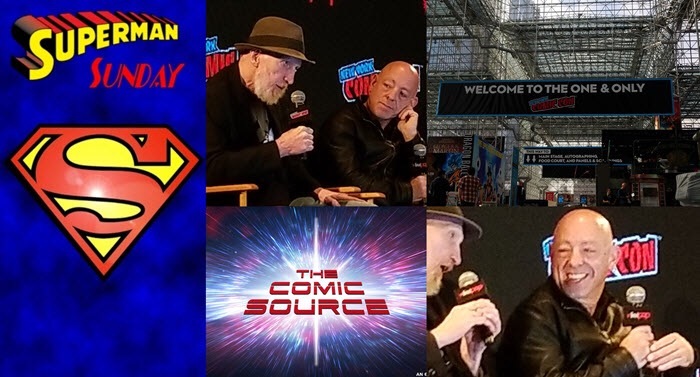 I recently came across a transcript of an interesting panel from last weekend’s New York Comicon, which featured Frank Miller and Brian Michael Bendis being interviewed by Dan DiDio. Even though the panel was billed as “Superman’s 80th Anniversary,” the history and birth of the character weren’t talked about all that much, as it seemed more a place for DC to promote upcoming Superman projects. Even so, I found a lot of the panel to be quite interesting in a sort of weird way, as was one fan’s analysis of it on a podcast I heard today. I’d never heard of “Comic Source” before, but apparently they do a special series called Superman Sunday, in which they cover material such as this, including panels from conventions and creator interviews. In this episode, host Jace Milan shares his thoughts on New York Comicon, his experience of meeting Brian Bendis and Kevin Maguire over the weekend, and analysis of said Supes’ anniversary panel. Unlike other podcasts, Jace does a great job of staying coherent, not overdoing the jokes, and actually making some really intelligent conversation. He’s a guy I’d enjoy going to coffee with and having a conversation about this stuff, which is probably when you know you’ve succeeded as a podcast. As for the panel itself, let me just say that I’m skeptical but optimistic about Frank Miller’s Black Label Superman project, and will be picking it up whenever it’s creators get around to finishing it. His thoughts on this project compared to his depiction of Superman in DKR was also quite fascinating. As far as Bendis goes, I do genuinely enjoy hearing about his experiences as a young fan in Cleveland, Superman’s birthplace, even if I’m a bit nervy about where he’s taking the character as a writer. 2018 has been a great year for Superman and very eventful. I love that we’re still reaping the benefits of all this in how much attention the character is getting right now, really since Action #1000 came out six months ago! Both the podcast and the panel are worth reading about, and I’m including links for both below. Please note that New York Comicon also featured some great events for Lois and Clark fans, which celebrates its 25th Anniversary this year, some which I’ve included in my links and videos pages as well. Enjoy! For more on Superman’s 80th Anniversary and Action Comics #1000, check out my links and videos pages!